The Department of Corrections in Indiana has 20 adult prison facilities on a tiered system within the state. 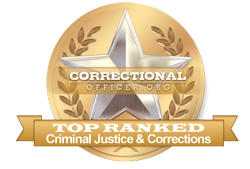 Designed to separate and incarcerate offenders based on violence of offense, rehabilitative opportunities, and length of sentence, each tier requires professional and accredited correctional officers to fill roles within the system. In Tier One facilities such as Chain O’ Lakes Correctional Facility and Edinburgh Correctional Facility, officers enforce living conditions for offenders who are transitioning to life in the community. In Tier Four (Maximum Security) facilities like Wabash Valley Correctional Facility and Indiana Women's Prison, officers enforce very restrictive security measures and inmates are confined to celled space. BLS.gov reports steady growth in the corrections industry over the next decade. While Indiana currently employs 6,303 front line correctional officers, that number is expected to increase by 5% to approximately 6,619 to account for new positions. There will be additional vacancies as officers retire, pursue other career paths, or advance to supervisory roles. For more information regarding this career in Indiana, read on. Calumet College of Saint Joseph ranks 1st in our latest rankings with 117 students graduating from programs in law enforcement administration out of a total 544 graduates. Trine University-Regional/Non-Traditional Campuses ranks 2nd in our latest rankings with forty students completing programs in law enforcement administration out of a total 398 students in the 2012-2013 school year. Martin University ranks third in our latest rankings with 9 students completing programs in criminal justice out of a total 106 students in the 2012-2013 school year. Ancilla College ranks fourth in our rankings with ten students completing programs in criminal justice out of a total 168 graduates. Indiana University-Northwest ranks fifth in our rankings with seventy students completing programs in criminal justice out of a total 1,690 students from the 2012-2013 school year. Indiana Institute of Technology ranks 6th in our latest rankings with seventy-one students completing programs in criminalistics and criminal science, criminal justice, and corrections out of a total a thousand students in the 2012-2013 school year. Indiana University-Kokomo ranks seventh in our latest rankings with thirty-six students completing programs in criminal justice out of a total 982 students. Saint Josephs College ranks eighth in our rankings with 12 students graduating from programs in criminal justice out of a total 420 students from the 2012-2013 school year. Vincennes University ranks 9th in our latest rankings with 110 students completing programs in criminal justice and security and loss prevention services out of a total 3,950 graduates from the 2012-2013 school year. Indiana University-East ranks 10th in our latest rankings with twenty-seven students completing programs in law enforcement administration out of a total a thousand graduates from the 2012-2013 school year. Having successfully completed the assessment portion of the hiring process, recruits are offered conditional employment that is dependent on their successful completion of training camp. Indiana's training camp focuses on teaching practical measure for the job, with a hands-on approach. Hires who are not successful at this stage will be released to find other employment. Indiana's State Department of Justice is committed to growth and development for the state's correctional field. Median income for this role throughout the state is $30,900, compared to the national median income level of $39,800, however professional development and seniority can boost salary. According to the employment profile for the state, published by CareerInfoNet.org at http://www.careerinfonet.org/occ_rep.asp?next=occ_rep&Level=&optstatus=011000000&jobfam=33&id=1&nodeid=2&soccode=333012&menuMode=&stfips=18&x=70&y=14 state trends predict a 4% increase in correctional jobs by the year 2022. In the state of Indiana, this translates to 240 jobs per year, both in newly created and existing vacancies. The table below lists career information obtained from the BLS for correctional officers in Indiana. The table is sorted by total employment, with the largest metropolitan areas listed first.